Fly Casino has Stars Awakening slot! A new 25-line game offers a wide selection aliens make up the lower value award symbols, joined by higher paying purple, blue, green, yellow and red planet symbols. After each winning spin, the Stars Awakening Supernova Scatters feature is triggerd whereby you’re awarded free a re-spin. The more wins and re-spins you win, the more scatters winnings appear. On the 1st re-spin one, the purple high win symbol is a scatter. On the 2nd re-spin, the blue and green scatters become scatters. On the 3rd re-spin, all five planet symbols become scatters. During your normal base game play, you may be randomly awarded a special 3X3 stacked wild re-spins feature. When this occurs one of the planets will stack on the right side reels to form one huge planet. The first and second reels will spin. Line up the right matching planets in you are in for out of this world wins. 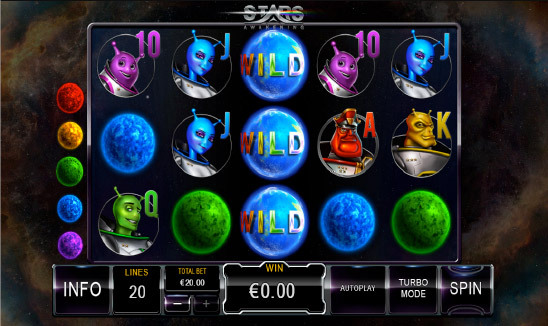 Try Stars Awakening at Fly Casino this weekend!